Sony NWZ-W202 review | What Hi-Fi? 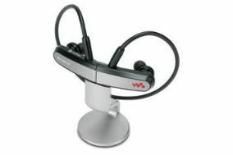 We doubt it's many folk's ambition to look like an extra from Red Dwarf, but there's no denying an MP3 player that involves no headphone cable whatsoever is a tempting proposition. Sony's NWZ-W202 is such a player. The headphone assembly includes 2GB of memory and all player controls (the picture shows the player on its charging cradle – 'break' the magnetic clip in the middle and you're left with two chunky headphones joined by something Sony's calling Spiral Form). Once the player's correctly positioned, the wearer may look like they're wearing two Bluetooth headsets simultaneously, but in fact it's a wireless Walkman. Sweet. Mercifully, it's a simple matter of drag'n'drop to load the '202 with music, but the resulting sound quality is a bit of a mixed bag. Iggy Pop's Nightclubbing doesn't want for punch or immediacy – the overall presentation is perky and attacking – but there's a definite thickening to the lower-mid/upper-bass area that some other, price-comparable players don't produce. But then other players need metres of speaker cable, don't they? We've saved a bit of space to talk about 'Zappin'. 'Zappin' allows you to hear little snippets of songs. The voice that tells you 'Zappin' is active is scary, but hilarious. You have been warned.